My grandfather had an amazing garden. I spent hours at his house and would eat all his cucumbers and sugar snap peas almost before they were ripe on the vine. I must have been munching on a fresh veggie one day when I came to realize how downright cool it is to garden. I decided I wanted to have a garden like my grandfather’s someday. Working at Dix.Hite, I finally got my opportunity. Through a mentorship program here at the firm, I shared my dream for a garden; a firm principal who owns property right across from our office volunteered his yard for the project. Thus was born an endeavor that has now become an employee-supported community garden. The thing I like most is that we are building community through this garden. We all help plant, nurture, watch it grow, and eventually harvest. The garden serves as an impromptu gathering space; while out there, we catch up with each other and connect on topics we might not otherwise. More than one happy hour has been planned while watering the cabbage. More important than happy hours (maybe), gardening feels good. It may sound strange to someone who doesn’t grow produce, but when I harvest vegetables that I grew myself, I get a little feeling of euphoria. And now, all the stuff I used to get from a grocery store I pluck directly from the earth. The community garden has been a lot of work, but completely worth it. I hope you’ll give one a shot. I’ve learned a lot about building a community garden, and I want to share some of those lessons here, so others can take inspiration and create gardens of their own. The garden needs at least one champion who takes on the majority of the responsibility for organizing events, planning the plots, cultivating involvement, maintaining enthusiasm and encouraging consumption of the goods. Plants won’t wait for the care they need, so someone has to be available when nobody else is. show up to pitch in. 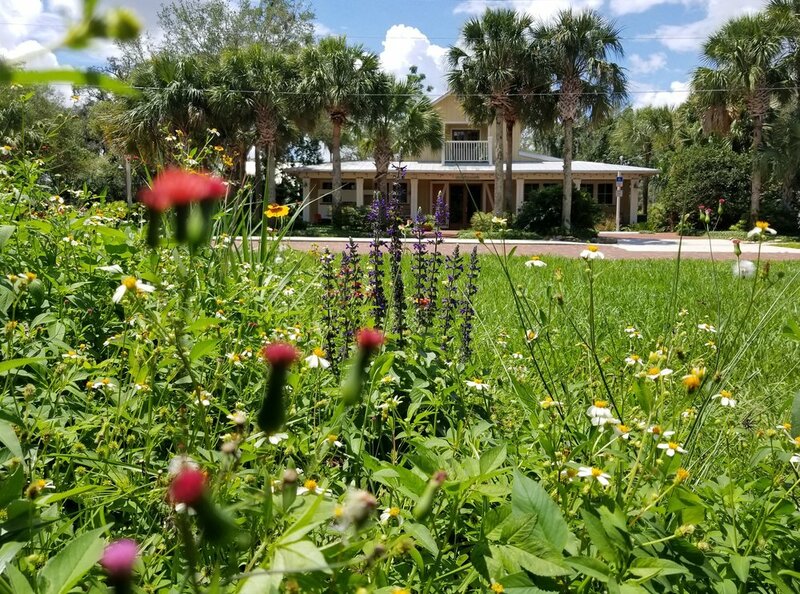 In Florida, where our headquarters are located, gardening seasons are unique and hopeful gardeners should use information specific to the region. The Institute of Food and Agricultural Services at Univ. of Florida is a great resource. Get good soil. A 50/50 mixture of mushroom compost and topsoil worked wonders for our garden. Be prepared to amend and fertilize soils between crops. Pests are a constant, especially in Florida. Research pest-control options and be prepared to apply. Some species—like kale, peppers, and lettuce—seem to have few problems, while others—like squash, cucumber, and tomatoes—seem to attract the pests. Be careful, though: don’t go too crazy with pest control because you don’t want to wipe out your beneficial bugs. Wasps, bees, and flies are ok if you see them in your garden. Don’t kill them! They are pollinating or eating pests. Maintain a pollinator garden nearby with lots of native plants so that you can attract beneficial bugs. Regular watering is extremely important. However, it is possible to overwater so make sure you are applying the right amount. We currently hand-water our garden and I’ve found this is a good way to get people involved. People take turns watering the garden – it gets them outside looking at the plants and noticing things they might not have noticed before. Just make sure your champion is checking on things. Irrigation like drip tubing makes life a lot easier, but takes some planning. Create a conceptual irrigation plan before starting to identify your water source, connections, and watering method (drip tubing, sprinklers, etc. Use digital media platforms such as Instagram and Facebook to promote your garden and gather interest. My wife Hillary has taken on this aspect of the garden. She is constantly taking photos and documenting the work sessions, the veggie growth, the pollinators, the pest problems, the harvests, etc. These posts are invaluable, as they generate a lot of support from the community and also provide great learning opportunities. Upon finding an unfamiliar pollinator, a great veggie, or a pesky pest Hillary will take a picture, do some research, and then create a post which has beautiful imagery and is informative for others too. Hillary does an amazing job and her posts allow many more people than just the Dix.Hite team to enjoy and watch and learn from the garden. Lastly, here is something interesting: while my colleagues have been fully engaged in building and maintaining the garden, it’s actually somewhat hard to get them to go pick and eat the veggies. So now I designate harvest days. When we have company lunches, I’m sure to harvest first and put the veggies out with the meal. And I send emails and colorful photos of the harvested produce sitting in the kitchen, to entice people to take it home. "Building a new garden is a burst of intense effort and then a continuous string of maintenance."